Unfortunately the elderly are often at risk when an official-looking letter like this one arrives. Thanks to the lucky spotting by her daughter, a 95-year-old woman from Bassington, UK, saved her money for another day. Her daughter had spotted a suspicious item of post she had been sent, reported the Ashbourne News. 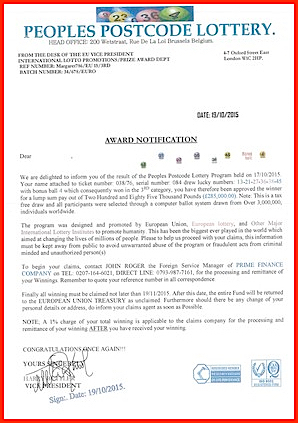 The letter claims she had won £285,000 (US$437,00) from the Peoples Postcode Lottery based in Belgium. Her daughter's suspicions were raised as a line in the letter insists a 1% charge of the winnings will need to be paid to process the claim. The letter says it can be made over the telephone on a London number or directly on a mobile phone number. A letter appears in your mailbox telling you that you have won millions of dollars in another country's lottery game. All you have to do to collect it is pay an administration fee to claim the prize - except you shouldn't. In America 90-year-old Walter Wier almost lost over $13,000 to a Florida lottery scam before the quick thinking of local postal workers stopped him. Luckily the police were able to track down the scammer. Walter Wier was about to lose $13,000 before USA postal workers saved him. Could You Fall For These Unbelievable Lottery Scams?